Oh Malawi, what have you done? 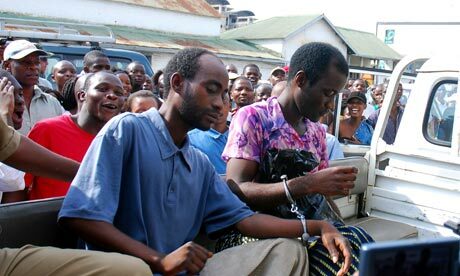 The sentencing in Malawi of two gay men to 14 years in prison because they professed their love for each other is wrong. Just plain wrong. You can call it morally wrong, or an affront to their human dignity, or a violation of their rights, but whichever way you look at it, it a clear instance of blatant discrimination. And the legal justification, arresting them under the penal code, is in direct contradiction with the constitution. The couple was arrested for “unnatural offences” and “indecent practices between males” from Sections 153 and 156 of the Malawi Penal Code. This is not compatible with the constitutional protection against discrimination of persons “in any form” and its guarantee of “equal and effective protection against discrimination.” Not only that, discrimination is clearly prohibited in the African Charter of Human and Peoples’ Rights. At a time when the Chair of the African Union is a Malawian, you’d think they’d be more careful about these things, no? What enrages me about the ludicrousness of this act is not only the unjust detainment of these civilians, nor the denial of bail, nor the preposterously excessive jail sentence, but that such a shameful act by a government takes place in a country I proudly called my home for two years of my life. Back in 1993 when I arrived in Zomba, where one of the men is currently being held in a prison, I was overwhelmed by the kindness of every Malawian I met. These people had lived under the oppression of colonial rule when the country was known as Nyasaland until 1964, then under a popular but eventually power-hungry and nuttier-than-a-granola bar self-proclaimed President for Life, His Excellency Dr. Hastings Kamuzu Banda. The early nineties brought along a new wave of hope as Banda finally left politics and the door opened up for multi-party democracy at the same time as South Africa. You could sense that a positive change way coming. I want to believe that Malawi is different. I want to believe that, despite deep entrenchment of values rooted in predominantly Christian and Muslim faiths, there is room in the hearts of Malawians to understand that everyone has the right to equality and non-discrimination. For a people who have suffered so long, and continue to suffer, I cannot believe that they can allow a human rights violation like this to go on without taking action. They were silent under Banda’s regime, but that time is long gone. Malawi was labelled “The Warm Heart of Africa” and I want this to remain true. There is opposition and outrage at this sentencing as there should be, but until Steven Monjeza and Tiwonge Chimbalanga and free to express their love for each other and lives their lives free of discrimination, we should not rest. We need to be vocal, we need to articulate that their rights are being violated, we need to urge the government of Malawi to release them and to revise its penal code, we need to speak up. Let’s not leave the advocacy to Madonna or content ourselves with the political pressure of other governments and organizations who may withdraw aid to the country. I want to believe in the Malawi I cherish so deeply in my heart. Commentators say a sentence to that Malawi prison is a death sentence. Hard labour and starvation. It is an appalling decision and unacceptable under the Malawi constitution.